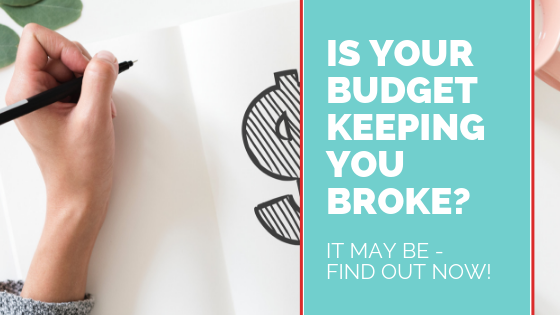 Is Your Budget Keeping You Broke? The other day, I spotted this headline, “Is Your Diet Keeping You Fat?” Well, if it’s a healthy diet, the answer should be “no.” The article went on to explain when people yo-yo diet, it damages their metabolism and sets them up for failure. That sets up the vicious cycle of restriction, then wild abandon, back to restriction… Well, you get the picture! 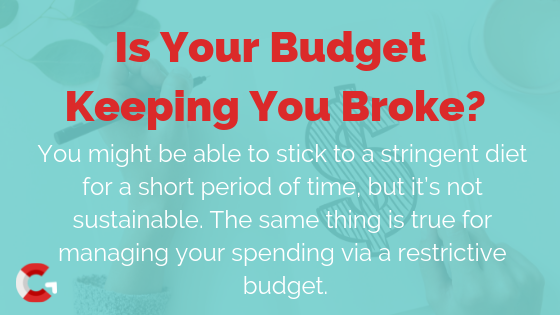 The same thing is true for managing your spending via a restrictive budget. For many years, I partook in the national pastime of January crash diets. “Behaving” myself for a month or two to lose the 10-15 pounds I had gained over the previous year. Until I found a solution that made diets obsolete for me: a healthy eating program I could live with for the long-term. I realized some time ago that the financial world needed the dollars-and-sense equivalent of a healthy eating program. A money methodology that made reaching one’s financial goals simple, fun, and flexible. This is baked into everything I do: my coaching, speaking, books, and online courses – especially my most recent creation: Financial Dignity on Demand. This 7-week money wellness program is NOT about adhering to strict budgets. You won’t have to drive a beat-up car, deny yourself Starbucks lattes, or live on beans and rice. The Financial Dignity on Demand program shows you a balanced approach for managing your money. Yes, you can still enjoy life while achieving your long-term financial goals! Tire of your budget keeping you broke? Find out more by clicking HERE.